. 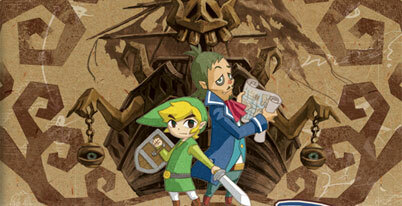 : The legend of zelda : phantom hourglass :. Home / Nintendo DS game manuals / The legend of zelda : phantom hourglass :. The legend of zelda : phantom hourglass manual Just click to open it in a new window then print the manual. Phantom Hourglass is an action-adventure game, and its gameplay is structured similar to other games in the The Legend of Zelda series. The player controls the protagonist, named Link, as he explores the world to find new items, information, and allies to free Tetra and defeat the evil of Bellum within the game. As the game follows chronologically after The Wind Waker, the game is primarily divided into two major game play sections: sailing between islands, and exploring the islands and their dungeons on foot. To travel between islands on the Great Sea, the player is given control of a paddle steamer called the S.S. Linebeck. The player can plot a course by drawing on a sea chart, redrawing the course to make alterations if needed, and then while in voyage, can shoot at enemies attacking the ship using the cannon (once obtained) and jump to avoid obstacles that may appear. Throughout the game treasure maps can be found, this creates a red X on the sea chart, plotting where the treasure lies. The player can then salvage these treasures from the ocean floor using the Salvage Arm (once obtained). When salvaging for treasure, a view of the undersea environment is shown on the bottom screen, and the player can control the speed and movement of the arm with the stylus. By dodging the mines scattered under the sea, the treasure can be brought back up to the ship. Once the player receives the Cyclone Slate from the chief frog, they are able to travel to other places in the ocean via cyclones by simply drawing the appropriate symbols on the Slate. These symbols can be obtained by hitting smaller golden frogs in the sea with cannonballs. Over the course of the game, the player can obtain ship parts through treasure chests, salvaging from the bottom of the ocean, prizes, and mail. These ship parts can be used to customize the S.S. Linebeck. By collecting ship parts from the same set, the player can increase the stamina of the ship, giving it extra health. The ship's health can be expanded to a maximum of eight hearts, but this can only be obtained by collecting the rare "Golden Ship" parts. When on land, the game shows a map of the area on the top screen, and a 3D top-down view of Link and his nearby surroundings on the lower screen. At some points during the game, usually during boss battles, a 3D view is shown on both screens, allowing the player to have a wider view of their surroundings, or show an enemy from a different angle. At nearly any time, the player can bring down the map to the lower screen and draw on it, typically to make notes but also to identify locations of objects for later reference or to control certain aspects of the world. The player controls Link through the stylus, moving him around by pointing to the sides of the screens, and interacting with objects and people, or attacking foes by pointing at them; other motions with the stylus can be used for additional moves and attacks. Tools common to the Zelda series such as the boomerang, grappling hook, and shovel are acquired through the game, and are used to open new passages to acquire additional treasures, all used by either pointing or drawing with the stylus. The game also uses the microphone for some events, including blowing out fires and defeating certain types of monsters, and other aspects of the Nintendo DS system, such as closing the unit to create an imprint on a map. The majority of Zelda games preceding Phantom Hourglass have had the player collect Pieces of Heart to increase Link's health. In Phantom Hourglass, Pieces of Heart are not scattered throughout the land as in previous games, but full Heart Containers are rewarded after defeating bosses, and some also for mini games, similar to the original game, The Legend of Zelda. The game possesses a number of stealth elements. In certain dungeons near-invincible sentries known as Phantoms, who can send Link back to the beginning of the room if their swords make contact with him, may roam the floor, with their location and direction visible to the player on the map, and will chase Link down if he is spotted or makes a loud noise. However, special areas on these floors allow a safe haven for Link to stay undetected in, even if he was detected just moments before. These special areas are called "safe zones" and play a crucial role in the main dungeon, the Temple of the Ocean King. This temple is filled with a miasma that will sap Link's life unless Link stays in these special areas or time remains in the Phantom Hourglass. The Phantom Hourglass is crucial for survival in the Temple of the Ocean King. It contains sand called the "Sand of Hours" and is able to protect Link from the temple's curse as long as there is time remaining in the Hourglass. If Link is defeated by a Phantom, some sand in the Hourglass is lost and Link must restart at the beginning of the floor. Additional Sand of Hours can be obtained by defeating bosses and salvaging it from the bottom of the ocean. The Phantom Hourglass' Sand of Hours can be expanded to 25 minutes.